Tonight is the first game in the best-of-three State of Origin Series for the National Rugby League, which pits traditional rival states, Queensland (the Maroons) and New South Wales (the Blues), against each other. Mention of the series tends to make people from New South Wales a little prickly and defensive, for they are all too conscious that for the past six years, they have been bested by a superior Queensland side. Some may be hoping desperately for a reprieve this year, because Queensland’s former captain, Darren Lockyer, retired at the end of the 2011 season. Generally acknowledged as the greatest rugby league player in history, he has set the record for most number of games played during his seventeen season career, and his list of achievements rolls on and on like the credits at the end of a movie, including a slab of stats that reduces everyone to a sort of silent awe. 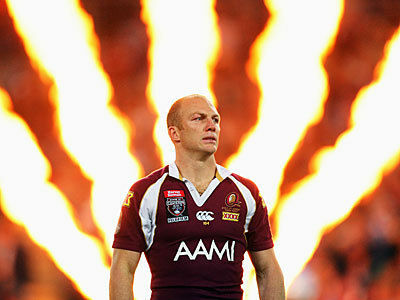 Amongst his many well deserved honours include being named in the Queensland Team of the Century, a 2 metre tall bronze statue of his likeness at Suncorp Stadium in Brisbane, and part of the Warrego Highway being re-named Darren Lockyer Way. As well as his feats of athleticism and natural talent, his inner strength and personal courage, he was also a model of good sportsmanship, a consummate professional, a successful leader, and a gentleman of the game. He is a champion, a king, and a legend of rugby league, who has left behind a legacy of which to be proud. Lockyer is an English surname which can either refer to someone who was a locksmith by trade, or who was a lock-keeper on a river or canal (or possibly even someone who lived near a lock on a river or canal). It’s pronounced very much as it looks: LOCK-yehr. According to Ancestry.com, it is a name originating in Dorset, and if you check the British census records, there do seem to be many Lockyer families in the West Country of England compared to the rest of the nation. Although Lockyer is a fairly common name in England and Australia, it appears to be quite rare in the United States. Apart from Darren Lockyer, the name is well known in Queensland, because the Lockyer Valley is an area of rich farmland in the Brisbane region. It is named after Edmund Lockyer, who came to Australia in the early 19th century as captain of the 57th regiment (he was from Devon, so the West Country heritage theory is holding firm). One of his first tasks was to explore the Brisbane River area, which is why the valley bears his name. I thought of adding the name Lockyer because I have already seen reports of parents choosing it for a baby name, and seen it on babies in birth announcements and baby contests. One man commented in a sports news forum that his neighbours had named their son Lockyer in honour of Darren Lockyer; his response was Why Lockyer for chrissake? What’s wrong with calling him Darren? It’s pretty obvious – Darren is currently out of favour, in the low 400s and falling. Meanwhile, the enormous popularity of Lachlan has made similar-sounding names very usable. Australian babies named Loki, Loic and Link, although unusual, do not seem strange or out of place here. Lockyer fits in perfectly with this trend, and seems like a name that would go down very well in Queensland, or anywhere which appreciates the greats of National Rugby League. The nickname Locky, shared with Darren Lockyer himself, almost makes it seem like a variant of Lachlan, which has the nicknames Lachie and Lockie. I find Lockyer to be a very intriguing name. I personally wouldn’t use it, but I’d like to meet a little Lockyer. Lachlan is not popular in the US as of right now (luckily! I adore this name! ), so I can’t see Lockyer catcing on anytime soon. Same here – I wouldn’t use it myself, but would be happy to see a few little Lockyers!